Forgot to thaw out those chicken breasts for dinner? 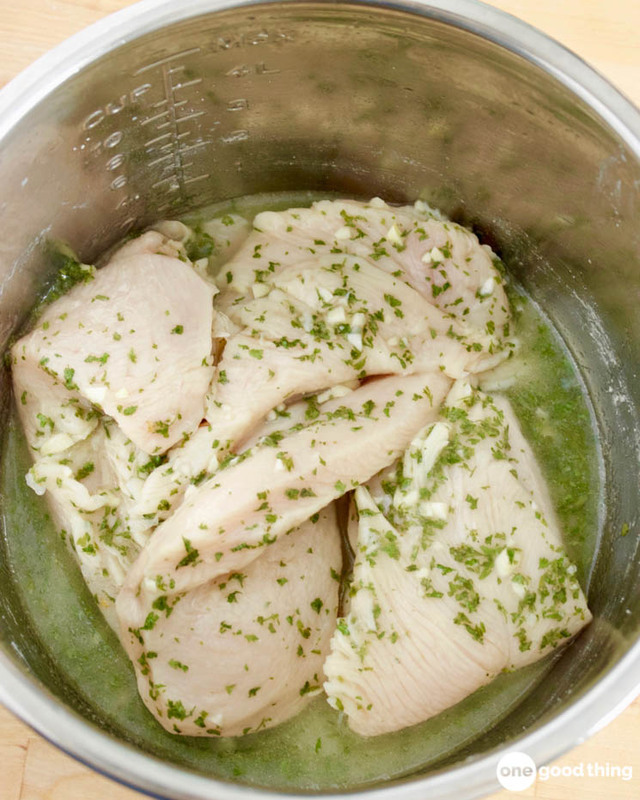 I'll show you how to cook those frozen chicken breasts to perfection using your Instant Pot! The process for cooking frozen food is a little different from normal Instant Pot cooking. I’ve broken down the process into 10 simple “Do’s and Don’ts” for you below! As long as you follow these simple tips, you’ll be cooking frozen foods in your Instant Pot like a pro in no time! Cooking frozen food in your Instant Pot will make it take longer to come up to pressure. The extra time does start cooking your food though, so you only need to add a few extra minutes to your cook time. When cooking frozen meat in your Instant Pot, you want to add enough liquid to cover the meat. This will help ensure that the meat gets cooked all the way through instead of staying frozen in the center. I suggest seeking out recipes that cook in some sort of sauce. For instance, my White Chicken Chili and Dump Chicken recipes would both work well for cooking frozen chicken! If you don’t have the time to brown your frozen meat before cooking, it’s not the end of the world. But if you do have a few extra minutes, I highly recommend doing it! Browning the meat before pressure cooking it will give your finished meal a deeper and more developed flavor. It’s a good idea to allow at least 10 minutes of Natural Release after the cook time is up. If you use Quick Release right away, your meat will likely end up tough and chewy. After 10 minutes (or more) of Natural Release, use Quick Release to release any remaining pressure. A few of my favorite frozen foods to cook in my Instant Pot are chicken breasts, frozen meatballs, soups, and fish filets. Give them a try! Just follow the cooking instructions below. When cooking frozen foods, big portions are not your friend. The more food in the pot, the harder it’s going to be to cook it all evenly. Cook as much as you need, but it’s not a great time to cook extras for leftovers. Cooking frozen chicken breasts is one thing, but trying to cook a whole frozen roast in your Instant Pot is not a good idea. The outside will cook while the inside is still trying to thaw. By the time the center gets cooked, the outside will be very overcooked, and no one wants that! You need a lot of liquid to cook frozen meats in your Instant Pot, but that doesn’t mean you should just cover it up with water. Foods cooked in water are likely to end up tasting pretty bland. So don’t be afraid to get creative! Chicken or veggie stock is a great choice, or you could use salsa, pasta sauce, BBQ sauce, etc. If you’re making a curry, coconut milk is a great option! And be sure to add some herbs and spices to give your meal more flavor! Have you cooked frozen foods in your Instant Pot before? I do frozen cow tongue in mine. 1 hour instead of 30 minutes. Which is still better than 3 hours low and slow on the stove top. What is the recipe and where do u buy tongue? #2 & #10 seem to contradict each other – use more water to cover vs. don’t cover with water. Did I misread? Thanks. Use more liquid, but not plain water. Sauces/broth are a better bet for non-bland food. #10 suggests using a tasty cooking liquid/sauce instead of water :-) Sorry for the confusion! So you can brown frozen meat? You’re talking about doing that awesome searing in a bit of oil in your pan before you put it in your Instant Pot? I did not know you could do that to frozen meat. Awesome tip. Do all of the foods you gave examples of, raw? Would the times differ much if the meat is already cooked? Say pre-cooked hamburger or chicken?